Thierry Wasser was born in Laussane, Switzerland on the Lake of Geneva. He studied botany from the age of 16, and at 20 earned a Federal Diploma of Botany. He then attended the Givaudan Perfumery School in Geneva and earned the title of Junior Perfumer by age 24. Two years later, he was sent to Givaudan in Paris and promoted to Perfumer. Thierry moved to New York City in 1993 and joined Firmenich as a fine fragrance Perfumer where he created many fragrances with Perfumer Annick Menardo. He created fragrances in partnership with Avon, Bath & Body Works, Calvin Klein, Dior, GAP, Liz Claiborne, and Mary Kay. After nine years in NYC, Thierry returned to Paris. 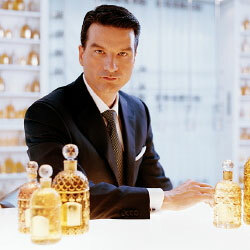 In 2008 at the age of 47, Thierry Wasser was appointed the in-house perfumer at Guerlain, where he collaborated with Jean Paul Guerlain.